Object number 22542 in the British Museum is a mummy-board, a cover that was placed on top of the mummy, which was then encased inside the outer coffin. It was covered in plaster to give the appearance of a raised relief and painted. This particular example dates from the 21st Dynasty but who the board was originally buried with is unknown. Instead, it’s come to be known as the ‘unlucky mummy’. According to the British Museum website, the mummy-board is said to have been bought by one of four young English travellers in Egypt during the 1860s or 1870s. Two died or were seriously injured in shooting incidents, and the other two died in poverty within a short time. The mummy-board was passed to the sister of one of the travellers but as soon as it had entered her house the occupants suffered a series of misfortunes. A celebrated clairvoyant is alleged to have detected an evil influence and urged the owner to dispose of the object, and so it was presented to the British Museum. But the accidents continued and night guards refused to go anywhere near the gallery in which it was displayed. The museum trustees decided to sell the exhibit. It was bought by an American who desired the antiquity for his personal collection, and who had the cursed object sealed in a container and placed aboard ship for its journey across the Atlantic. The ship was the Titanic. It’s a good story, even if as the British Museum website makes clear, there’s no truth in it. Exhibit number 22542 never left the British Museum until it was sent on a tour of Japan in 2003. 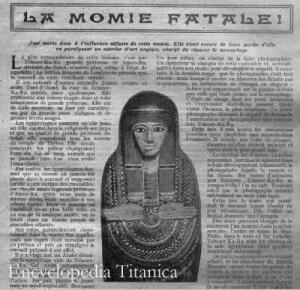 Also a study of the Titanic’s manifest reveals no ancient Egyptian corpse carried as cargo. There was though a live 27-year-old Egyptian onboard the Titanic. 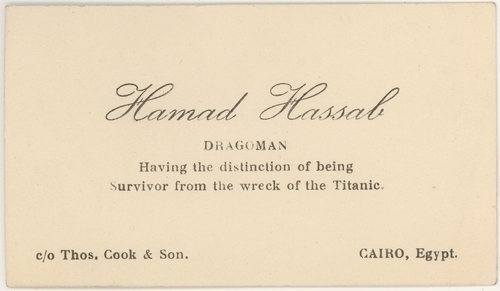 He was Hamad Hassab, a dragoman employed by Thomas Cook & Son in Cairo, whose offices were at Shepheard’s hotel. I came across Hamad while researching Grand Hotels – dragomans, or guides, being an essential, or at least unavoidable, part of the travellers’ Egyptian experience. He was in the employ of Mr Henry Sleeper Harper and his wife, Myna, who were returning to America after a tour of Europe and Asia that had included a stay in Egypt, where they’d engaged Hamad – and presumably decided to take him home with them. After the liner struck the iceberg, the Harpers, their servant and their Pekinese dog, Sun Yat-Sen, were all safely evacuated in Lifeboat 3. Three days later, on disembarking in New York on 18 April, Hamad sent a telegram to his brother Said who worked at the Mena House Hotel containing the succinct message, ‘All safe’. At some point Hamad returned to Cairo and resumed his job as a dragoman. 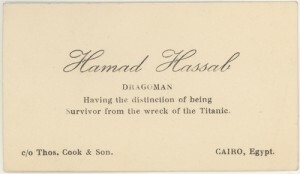 He had a businesscard printed up which, underneath his name lettered in cursive script, bore the legend, ‘Having the distinction of being survivor from the wreck of the Titanic’ [sic].